I really enjoy that our St Francis 50 catamaran, SV Aphrodite, has been stepped on, sailed and explored by many people before us. For starters, Angelo Lavranos designed our boat. He is based in New Zealand, and St Francis Marine, led by Duncan Lethbridge is in South Africa. What makes their partnership interesting is that St Francis Marine began in 1988 when Lethbridge commissioned Lavaranos to create a comfortable cruising catamaran (St Francis 43) for his own family. I loved that boat so much. I think about her all the time. I’m glad she has a new family and will be in the beautiful Caribbean waters again. I lived on her for 5 years, travelled many, many miles and have amazing memories of my time with her. she is a world-class passage maker…In my opinion, you’ve selected the best cat for your family. In short, lots of people have been aboard and have enjoyed our boat. At a boat show, probably someone’s child had a jump on one of the beds before being asked to get off. Or, maybe that only happens to the kids in our family. 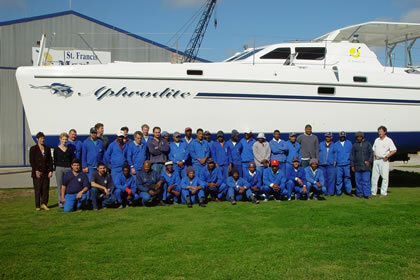 Tonight, I found this great picture of the people involved in designing and building our boat, SV Aphrodite. These are people I likely will never meet but who gave our boat attention, thought and care, and perhaps reason to swear at times. I am looking forward to stepping aboard myself and living on this lovely boat with my husband and our four children. I like to think that our boat is already filled with echoes of life and laughter.